I recently started a Freezer Meal Swap to help stock my freezer, and also get me out of a recipe rut. 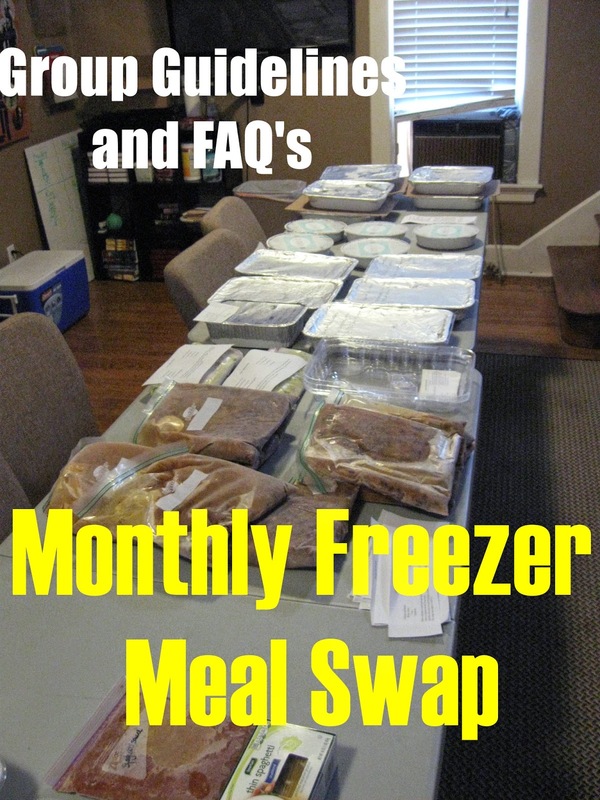 A freezer is NOT Cooking party, all meals are made in the participants homes on their own time tables- click here the differences here between prep party and swap. You can host a Swap Monthly, Bi-Annually, or whatever timeline fits for your group! • Contain enough servings to feed of a family of 5-6 people (8 x 13 pan if casserole). Err on the side of generous with portions. • Please one copy of typed recipe to lay next to dish at swap. This is important to aid those families who have dietary concerns. WHAT KIND OF MEAL DO I BRING ? Each woman bring multiplies of the same main dish. There are several great ideas on pinterest, but make sure the recipe is freezer friendly (MANY meals do not freeze well). Preferably you have made the meal yourself already and know it works. The meal should include at a Protein + EITHER a Vegetable OR a Grain. Example-Instead of bringing taco meat, you bring freezer Burritos or Taco Soup. Or if you bring BBQ Pulled Pork, you bring buns. We are going for ease of prep for the Mom who is making the meal. Please use your own good judgment on this guideline, I only have this rule to prevent a woman who makes 8 lasagnas doesn’t feel shorted by someone who threw two pieces of chicken in a bag with a jar of Italian dressing. HOW MANY MEALS DO I BRING? You bring the amount of items that you would like to bring home. For instance; if you have a freezer that only fits 4 freezer meals, you bring 4 meals and leave with 4 meals. Watch the event page to see how many people are coming, you will not need to bring more than the people who have RSVP’d yes. Do not forget to include yourself twice, one for our family's dinner that night and one for your own freezer. HOW DO I KNOW WHAT OTHERS ARE BRINGING? Those who RSVP yes must list Thread on FB event page what they will be bringing to avoid duplicates and allows those with dietary concerns to know if there will be anything for them to take home. Please include link if you found online. DO I HAVE TO FOLLOW ALL ALLERGIES/DIETARY CONCERNS? With so many people participating, we are not able to make every dish to fit all dietary concerns, but everyone must label meals clearly and bring printed recipes so families can choose the dish that works for their needs. Dairy Free and/or Gluten Free Meals are always welcome, and allow more families to participate. HOW DO I PICK MY MEALS AT THE SWAP? Bring your cooler with your already frozen meals to swap. We will lay meals on the tables with our printed instructions. Each women draws a number from a cup. After the first person picks her first meal, the second person picks one meal. This continues until everyone has chosen their first choice of meal. Continue the rotation over and over again until all the meals are gone, and everyone has chosen the same amount of meals they brought. Yes, but mothers are responsible for their own children during the swap (no sitter provided). HOW LONG DOES THE SWAP LAST? The swap lasted about 15-20 minutes. It is not necessarily a fellowship event, but an event to help busy families to stock their freezers with easy-prep meals. HOW DOES A FREEZER SWAP SAVE ME MONEY? Since each women is making multiplies of a single recipe, she can buy ingredients in bulk. It should also cut down on eating out if we have meals ready to make for dinner.